Do you want to prevent allergen recalls? Set up a good and robust allergen management system according to the SimplyOK criteria. This ensures reliable allergen information so that the consumer can make a safe choice in case of an allergy. The SimplyOK certification scheme, also called Code of Practice or European Allergen Information Certification Standard, is ready to audit! Version 2 is launched July 2018. The European Allergen Information Certification Standard can be used by every food business operator, from farm to fork (also B2B). Improve your allergen management system and prevent allergen recalls by implementing the latest version 2 of the Simply OK Code of Practice. To provide correct allergen information, information from suppliers is required. Practice shows gathering the needed information can be difficult. Allergenen Consultancy has developed a template, which we support, with the aim to standardize the exchange of allergen information in the food chain. In addition, a quantitative risk assessment of cross-contamination of allergens (in accordance with VITAL®) is possible on the basis of this information. Foundation SimplyOK developed a certification scheme, to audit the allergen management system of the food business operator. It provides customers the warranty of substantiate allergen information, from the list of ingredients, gluten free or lactose free claims and even in case of cross contamination. A precautionary allergen statement however is only applied when cross contamination cannot be prevented and a risk assessment is conducted by means of the VITAL® program. VITAL® has a scientific base and has laid down safe limits for each allergen, so called reference doses. 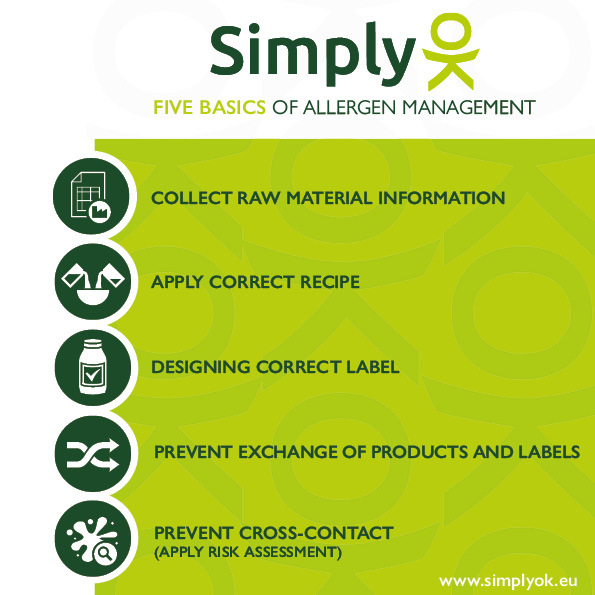 The requirements on allergen management in SimplyOK are built on five basics. They are determined on the basis of years of experience and lessons learned from recall analysis. Food business operators can check their allergen management system through a third party audit. This audit will be performed by special trained auditors in addition to your FSSC-, BRC or IFS-audit. SimplyOK is a non-profit foundation with the purpose of providing clear, reliable and complete information about allergens on food labels. Since 2013, a team of stakeholders from retail, industry, science, medical specialists, patient organizations, certification bodies, etc. are intensively working together to set up a certification scheme with requirements to an allergen management system. Key features include; applicable to any organization, low entry cost and risk based upon the VITAL Program. The SimplyOK mark will be available in future for food businesses who have succesfully prove to meet the requirements of the SimplyOK Standard. The first auditors are fully trained. Vinçotte ISACert and Lloyd's Register are ready to perform your SimplyOK audit. SimplyOK is proud to announce Dutch Protein & Services is the second company to be certified in line with the SimplyOK Code of Practice: the highest level of certification in allergen management. The first company is certified against the Code of Practice of SimplyOK. On the 11th of December 2018 Petra Hol, representative of certification body Vin�otte ISACert, handed over the first Simply OK certificate to Nelleke van der Wekken, Quality Assurance Manager at Dutch Spices. The first companies are audited against the SimplyOK standard. VMT - medium for Dutch and Belgian food industry- has interviewed two companies: Dutch Spices and DPS. Read full article (in Dutch or use Google translate). Version 2 of SimplyOK Code of Practice has been approved by the Board of Stakeholders. There are several modifications in this version to improve the auditing process and to support the lactose free claim. An important adjustment in the audit protocol is the introduction of a phase 1 and phase 2 initial audit. For products with the claim 'lactose free' a limit is laid down and additional requirements to labeling and analysis on lactose free dairy products are added. Royal VEZET discussed their findings while implementing SimplyOK during VMT Allergen Day on the first of February 2018. Based of the request of Albert Heijn, they have anchored the requirements of the Code of Practice in their processes. The presentation is available. The first companies signed up for certification! Retailer Albert Heijn requires their private label suppliers to upload a VITAL® report in their product specification system TraceOne. Based on this information a precautionary allergen labelling 'may contain traces of...' is used when applicable on the label. As allergen management covers more than only cross contamination, Albert Heijn decided to give more emphasis on an adequate allergen management system. March 2017 private label producers are requested to set up an allergen management system where the SimplyOK Code of Practice and VITAL® are leading. The SimplyOK Code of Practice is based on the five basics of allergen management and a risk assesment of cross contamination according to VITAL®. All detailed requirements according to the five basics are listed and how to conduct a VITAL® risk assessment are explained in the Code of Practice. Dutch Allergy Foundation has presented September 2014 SimplyOK as 'European best practice on food allergen labelling' to the European Parliament.